The program is now accepting student applications. Applications are due by midnight, January 23, 2019. Every year, NGRREC hosts a highly successful summer internship program for college sophomores, juniors and seniors. This prestigious program is a paid internship opportunity and gives students a chance to gain real experience in a variety of environmental careers such as ecological research, fisheries science, education, social science, and policy. At the conclusion of this internship, students present their project results to their fellow interns, research advisors, and invited guests at a professional, two-day Intern Symposium. 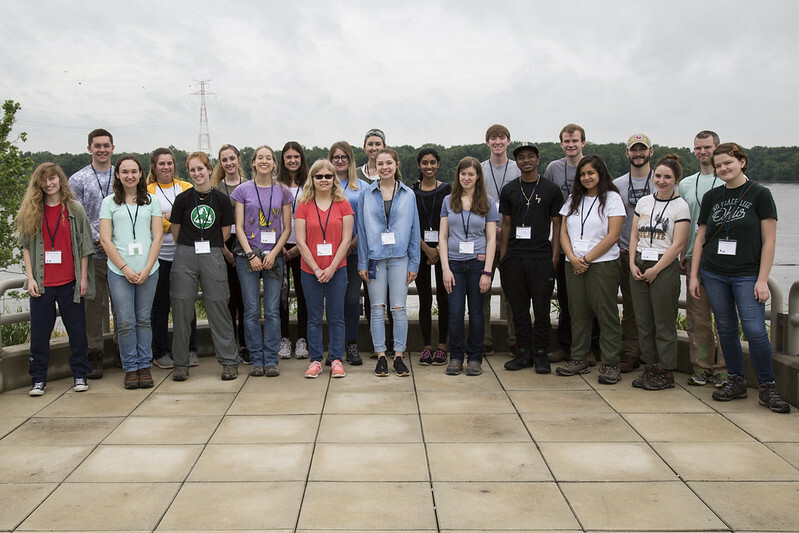 We recently received a diverse array of project proposals by faculty and agency advisors from organizations throughout the Mississippi River Watershed, each wishing to mentor a NGRREC college intern through their research experience. We are now accepting student applications to match qualified and motivated students with each of the projects selected. Each 10-week paid internship is managed by an advisor who is responsible for instruction, supervision, and mentoring of the intern, as well as the design of the summer project. Students receive up to a $5,000 (pre-tax) stipend for full participation in the 10-week program. Additionally, funding up to $1,000 is available to help offset some of the summer housing and/or transportation costs to the internship location. The Project Summaries document outlines each of the 2019 projects, including a summary, location, and intern duties and responsibility for each project. Please note that students apply to the program, not a specific project. During the application process, students will select up to three projects of interest to assist in the matching process. You will NOT be able to save your application form and return to it later. Please make sure you have all your application materials ready before starting the online application form. To help you prepare your materials ahead of time, download the application questions and review the application requirements on this page. ALL students are encouraged to apply, including community and junior college students and international students. We are looking for students who may not have extensive research experience, but have shown initiative to gain experiences in science, through either volunteering or prior employment, participation in clubs, etc. and look to gain either their first focused research experience or to provide specific/targeted experience in order to achieve their outlined career goal. To apply, students must complete this online application form. Applications will not be accepted via email or postal mail. If you are not currently enrolled in an undergraduate program, you are not eligible. Available to attend both the Short Course (May 20-24) and Intern Symposium (July 29-30 if accepted as an intern. No exceptions. Are legally permitted to work in the U.S.
Work visas must already be in place at the time of application – NGRREC and L&C are unable to sponsor visas for these positions. Some projects have other, specific requirements (e.g., ability to swim, a personal laptop). Please take this into account when selecting your projects of interest and answer all application questions accurately to ensure a proper project match. Biographical sketch - Submit a brief statement (100 words or less) about yourself, your interests, and where you see yourself career-wise in 5 years. This information will be included in the printed symposium proceedings handed out to all attendees at the Intern Symposium. Resume - Include all relevant coursework, previous employment, internships, and volunteer positions. Organization name, location, and dates should be included. College transcript - an unofficial copy will suffice as long as your name is clearly visible on the transcript. A screenshot or a typed Word version of your transcript will not be accepted. Cover letter (optional, but encouraged) - Feel free to include a cover letter outlining what makes you a good candidate for this internship. Include any additional information, such as your career and academic goals, that would help us assess your fit for our internship program and match you with the right project. July 29-30: Intern Symposium (attendance required). A Call for Proposals is distributed each fall to potential advisors. The proposals have been reviewed and selected by a panel, and the list of available projects is posted above. Projects are contingent upon available funding. An online application process, along with a list of available projects, is usually made available in December. The Internship program is highly competitive - we receive more than 130 applications per year. This year we anticipate selecting 20 qualified interns. The program is open to all current college students, with preference given to students in their sophomore and junior years. All college students are encouraged to apply, including community college and junior college students and international students. Locations differ each year according to where the advisors are located. Placement locations are offered primarily throughout Illinois, but often stretch into Missouri and Wisconsin and have even included sites in Louisiana, Mississippi and Oklahoma. When you are considering a project, please consider factors such as transportation (Ex. Do you have a car for placement in a remote location?). Program coordinators will help identify available housing options in each project location if needed, and students receive up to $1,000 in reimbursement funding to assist with summer housing and relocation costs. Previous year's programs are available below. Please download one of our Intern Symposium Proceedings which include abstracts and posters from each project.